In the past several days in West Virginia, actions on Peter’s Mountain have continued against the Mountain Valley Pipeline (MVP). On April 2nd, a new tree-sit was also launched in an orchard. As news is coming out at a rapid pace, we’ve created a roundup of recent actions and videos from Appalachians Against Pipelines and Farmland Against Pipelines. It’s now been one week since the monopod tree-sit was erected on a mountain road, in an attempt to stop pipeline construction. This move itself came about a month after an earlier tree-sit was made public. As the tree sits continue, residents in the surrounding area, many of which are in the middle of legal battles with MVP to keep their homes, began to rally in support of the resistance and also send up supplies. In response, police have set up a “free speech” area far away from the monopod in an attempt to cut off supplies and support, but have so far been unsuccessful in stopping the tree sit and people from mobilizing in solidarity. Good morning and hello from the pole sitter on Peter’s Mountain – IT’S BEEN A WEEK! Sometimes even I find it hard to believe. In that time, I’ve gotten repeated visits from multiple varieties of cops, reporters, MVP employees, and – by far most importantly – by well over a hundred amazing supporters from so-called Virginia and West Virginia, all resolutely opposed to this pipeline. Many of you brought much-needed gear and supplies, many of you hiked around two miles after the ridiculous forest service road closure. Your energy and enthusiasm makes staying up here worthwhile. For over two years, MVP has been trying to silence, suppress and ignore those who do not want to see their water poisoned or the land they love attacked. In the last months, many grew understandably disheartened as state officials refused to heed their calls, federal authorities granted permission after permission, and MVP began cutting trees. Now I’m hearing time and time again about how direct action on this mountain is inspiring those people and giving them hope again. I know that people are already taking concrete action – I just heard yesterday about the folks autonomously taking to the trees to defend against pipeline construction in Roanoke County. Who knows what could come next? With people enraged by this pipeline and open to new possibilities of resistance, I’m excited to see what could emerge. I think this should frighten MVP more than any specific work stoppage – that hundreds of people living along the route are opposing the pipeline, are frustrated by a legal system rigged in favor of extractive industry, and are gaining hope and energy in this new stage of the battle. No one is going to stop this for us. Together we can stop it ourselves. I thought I had shared enough photos of cops and workers staring at me for a while, so the image below this post is of my view looking up towards Peter’s Mountain, past the anchor lines running down to that side of the road. Sadly this phone camera does it little justice. Forest Service Law Enforcement does continue to maintain a 24 hour presence at the blockade, including pulling up to the gate and shining their headlights at the monopod overnight, and telling ground support not to send food or water. Fortunately supporters have continued to be able to set up camp right by the blockade – please come visit if you like, and message the page if you want directions or info on what supplies we could use! In another big development, on April 2nd, it was announced that another tree sit had been launched, this time, occupied by a 61 year-old woman identified as “Red,” who sat atop a tree in an orchard. This new tree sit shows the degree in which locals are supporting pipeline resistance, and are also beginning to take part in the broader campaign. Social media accounts on Twitter and Facebook named Farmlands Against Pipelines have been also been launched, and are promoting and following the ongoing orchard tree sit. Today at 1PM EST Mountain Valley Pipeline, LLC attempted to survey a family orchard in Bent Mountain of Roanoke County, Virginia slated to be devastated by the proposed 42-inch fracked gas pipeline. The surveyors discovered a 61 year old woman identified as “Red,” in a platform attached to two trees 30 feet in the air. After discovering Red, MVP surveyors contacted Roanoke County Police, who drove by the property but did not confront her. Red and her family will need support to continue resisting the Mountain Valley Pipeline. Red could lose her job to stay in the trees and is looking for financial support to pay her bills as well as fund materials like food and gear to sustain resistance. To make a donation, please visit: https://actionnetwork.org/fund…/farmlands-fighting-pipelines. If you aren’t able to give financially, please consider reaching out to FarmlandsFightingPipelines@protonmail.com or reach out to Farmlands Fighting Pipelines on Facebook. Today marks FIVE WEEKS of the tree sits on Peters Mountain, and FIVE DAYS of the monopod blockade in Giles County. Here’s a great video sent to us by a local supporter who had a deer follow him up to the monopod over the weekend. And some thoughts from that supporter on the monopod blockade. If you’d like to join him in a hike to the gate this week, send us a message and we’ll put you in touch! Mountain Valley Pipeline LLC has seen the fire of resistance in our communities, and they are doing their best to put it out. On Friday, before the closure of Pocahontas Rd, MVP had police arrest one of our supporters in an attempt to intimidate us. At MVP’s insistence, the supporter was arrested and charged with driving recklessly into the parking lot at the monopod gate, despite multiple witness statements saying that no such incident had occurred. We won’t let MVP’s intimidation dampen our spirits! The supporter was quickly released from jail and has a court hearing in a few days. Let’s show MVP their petty tactics won’t get to us—come on down (or up) and give us a visit! We would love to see y’alls faces at the tree sits and the monopod (which is still welcoming supporters despite the woodsy hike to get there). Message us if you need directions! 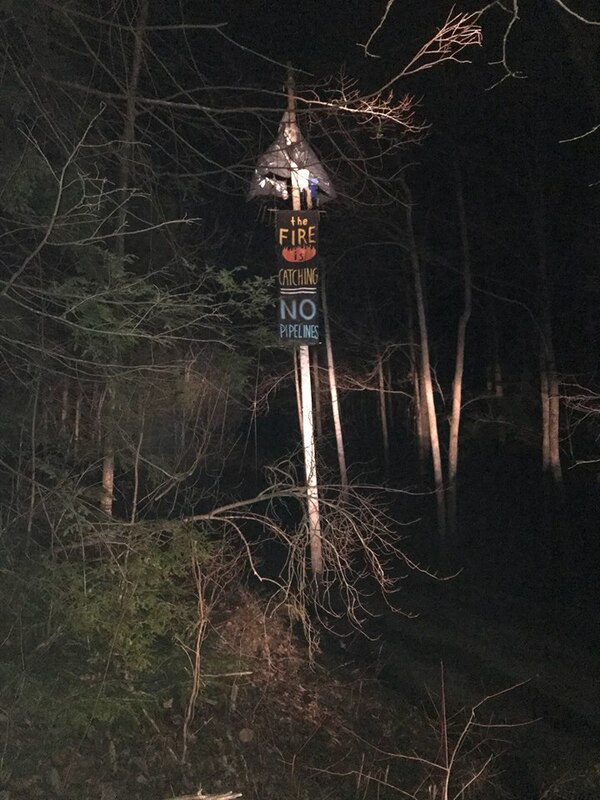 US Forest Service shone a spotlight on the monopod blockade since 8:30 pm, though well before midnight they had switched to only shining their headlights, after trying to mount the spotlight on multiple vehicles and apparently having issues with it burning out. The Forest Service maintained at least two trucks by the gate and one at the start of the road closure all night long. At 7 am it seems the night shift was supposed to be replaced by MVP security, but thus far this Sunday there has been no sign of any MVP employees. At around 9:30 am one USFS truck left, and one remains in the road near the gate. Supporters are still barred from entering the road itself, but have been able to continue camping in the woods nearby. Anyone willing to make the hike is still more than welcome to visit! Pictured here are some supporters at the gate yesterday (before USFS closed Pocahontas Rd to foot and vehicle traffic other than MVP), and some notes sent up to the monopod from some of our younger supporters. Here we are. Surpassing many expectations, we have effectively held our front past the deadline for tree clearing. And in the meantime, even more ground has been gained. Territory that was condemned for the life-collapsing interests of MVP, has been reappropriated as a site for life-affirming struggle. As I speak, a cool breeze rustles branches and a bird chirps above me in a tree that would not exist if MVP had their way. Not only is this tree alive but I have been made more alive through the process of our radical coexistence– our co-becoming. On this day, there is certainly a victory worth celebrating. But nothing is worse than the victory that one does not know what to do with. So we invite you again to think through where we go from here with us. We have revealed that Peters Mountain has a particular significance to MVP. Elsewhere, pipeline companies have commonly avoided confrontation with sites of resistance, while they build everywhere else instead. But here, immediate offensive tactics have been attempted against us in order to end our stand. Fortunately they have failed and after a month of delayed construction, we’re still f****** here. Another thing we know is that MVPs twin, the ACP, a proposed pipeline 100 miles north, was just denied an extension for tree clearing from FERC. We can’t say with certainty what this means for our context but it doesn’t bode well for MVP. And in this time of delay, we have also seen new sites of resistance sprout up along the ACP route. Since January, MVPs financial position is worsening. The patient company EQT’s stock has been dropping over the last six months. In February, MVP had to put up $32 million dollars liquid cash in VA alone (we can only imagine the favors MVP called in to make that possible for a company with no employees and no money in the bank). EQTs president and CEO resigned two weeks ago; a board room fight has led to the company splitting. Finally, we know that despite regulations prohibiting tree clearing, pipeline companies have illegally cut trees anyways. Often they preemptively account for the cost of these violations in their budget. Alright, let’s talk about what we don’t know. We don’t know to what extent MVP is prepared to bear the consequences of illegal tree clearing. Will they advance in the tree cutting as planned, or will they just focus on constructing sites where cleaning is already done or unneeded? We also don’t know the extent of consequences that could result from their negligence. Will the DEQ or DEP step in to enforce beyond a fine? Would they impose a stoppage of work? We’ve found that the DEQ or DEP doesn’t typically act in accordance with the interest of the people until they are pushed to do so. Finally, we don’t know who or what other factors might arise to intensify the consequences of restricted tree clearing. Of course, we all have some ability to determine this one. On that note: one more thing that we’ve learned since this all started. The only thing that has rerouted the unceasing path towards construction is the motion of people into forms that are recreating the world that the pipeline project is moving through. Little did MVP know, they would be operating in hostile territory. In fact, they couldn’t have known. Because in the places where there power is maintained– the courts, the government agencies, the legislative bodies– formalities have closed in on and sought to eliminate any space for an alternative to the existence of this pipeline. Now it is the absolutely alternative essence of the people’s action that is closing in on the possibility of this pipeline, while also opening the realm of possibility for our own movement. Alternative because we are not interested in the current Order of things. Alternative because the very fact of our continued existence totally undermines all that preserves that Order. And so we are not limited to “good behavior” in the expression of our existence– in the expression of our humanity. As we continue to act, ruptures will form in a process designed to legitimize fossil-fuel infrastructure without interruption. So from what we have learned, if we want this tree clearing deadline to have any actual significance, we will have to make it so. We have been, and will be, the actualizing force. Wherever you are, find us; we are keeping a look out for you. Keep up with the Appalachian pipeline resistance by following Three Sisters Camp, Appalachians Against the Pipelines, and Farmland Against the Pipelines.